On December 7, 2012 RadioFreeMarket.com Founder Michael McKay, at the invitation of Dr. Yuri Maltsev, spoke to four economic classes at Carthage College on the basics of money and money management. 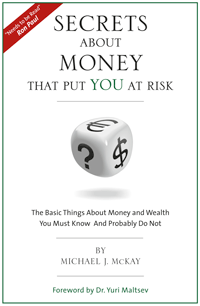 In the 40 minute audio recording that is linked below you will hear Michael discuss something that most people don’t think about: What Is Money? You will likely be surprised by his definition. Then he outlines what better and worse money is, respectively. He then presents Money Management in a new and foundational way that is applicable to every person, household and business. Before listening to the lecture it is highly recommended that you first download and print two document links (here) and (here) that were used as handouts during the lecture. The firstlink takes you to an outline for Lesson 1 and a chart that is important for Lesson 2. The second link is a pdf of old expired monies from Saddam Hussein’s Iraq, the Hyperinflation in Zimbabwe, Postage Stamps from the 1923 German Weimar Republic Hyperinflation and even coins from modern Turkey that have expired. This document is valuable for Lesson #1. With these documents in front of you his presentation is easier to follow and understand. Time allowing, Michael intends to later recreate these lectures as Vimeo or YouTube videos. For now, it is our hope that you will find the audio presentation valuable. Please note: The lecture begins with introductory comments from Dr. Yuri Maltsev and closes with very valuable comments from him. The first few minutes of the audio may be too soft or too loud but quickly balances out throughout the rest of the presentation. The audio link is (here). This entry was posted in Austrian Economics, Money. Bookmark the permalink.